Effective May 10, 2013, Regal Air has acquired Crown Aviation. Regal Air’s maintenance personnel have moved to the Crown Aviation facility. All Crown Aviation personnel are continuing with Regal Air. Regal Air and Crown Aviation are committed to providing an even greater level of quality service to its customers and the aviation community. We specialize in the inspection and repair of engines and airframes. 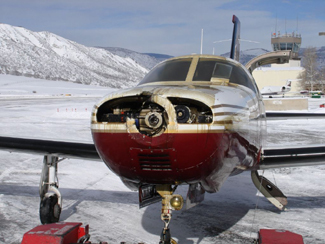 In addition to being a Cessna Service center, our technicians are trained and experienced in the maintenance and servicing of Beechcraft, Piper, Columbia, Mooney and Maule aircraft. With over 90 years of combined maintenance experience, our staff will provide prompt courteous and friendly service. No matter if you need an oil change or an engine change, we will strive to make your maintenance experience a satisfying one. Now offering full-time bench work! We can also update software. Regal Air & Crown Aviation LLC are Divisions of Morcom Aviation Services, Inc.